For over thirty years, I have been painting with Jack Richeson and Co. brushes, and I can tell you that these are among the finest oil brushes made by anyone today. They'll do anything you ask of them and last for years. Try them—you won't be disappointed. You'll become a fan. 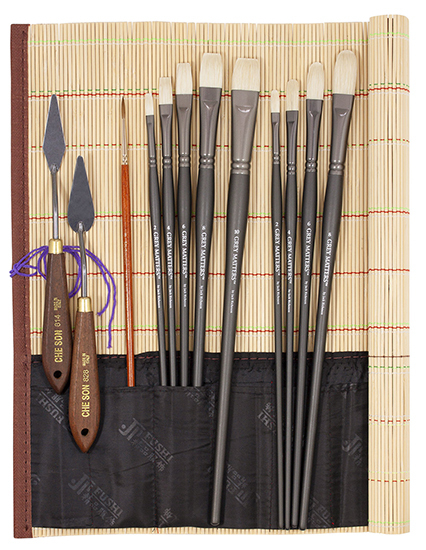 This plein air oil painting brush kit includes: Grey Matters Hog Bristle Bright Size 10; Flats Size 8, 6, 4 and 2; Filberts Size 8, 6, 4 and 2; Kolinsky Pure Red Sable Round Size 8; 2 Italian Painting Knives 2 1/4" x 5/8" and 2 1/8" x 3/4" and a deluxe Bamboo Brush Holder with Cloth Pockets. Click the button below to add the John Hulsey Plein Air Oil Brush Kit by Richeson to your wish list.